One thing I hate doing is cleaning draft lines on my keezer and jockey boxes. It's just not a whole lot of fun, it's time-consuming, and it can be messy. Long story short, it's probably the one homebrewing task that's an all-around pain. That said, it's also crucial if you don't want your homebrew riddled with off-flavors and off-aromas due to dirty lines. My solutions to this chore have evolved over time, and I just added a new piece of equipment that should make it less of a pain. In the spirit of sharing ideas, I've listed the solutions I've employed, along with some pros and cons of each. Garden Pump Sprayer - Basically you fit a ball-lock post onto a handheld garden pump sprayer, fill the reservoir with beer line cleaner, pressurize and run it through your lines. Pros - It's a pretty cheap solution. It does a halfway decent job...at least it's better than not cleaning your lines at all. It's portable so it's still what I use to flush out my lines after pouring at festivals and such. Cons - The best cleaning happens with constant fluid movement, aka recirculation. The process for me was flush the line with hot water, fill line with hot line cleaner, let it soak, then finally flushing repeatedly with more hot water. In between, you're refilling the sprayer, pumping, etc. If you have more than one tap, it gets old quick. 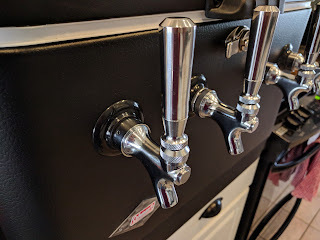 Keg Jumpers - I got these nifty little items from BrewHardware. Essentially these are double-ended liquid ball lock posts used to join two ball-lock disconnects. 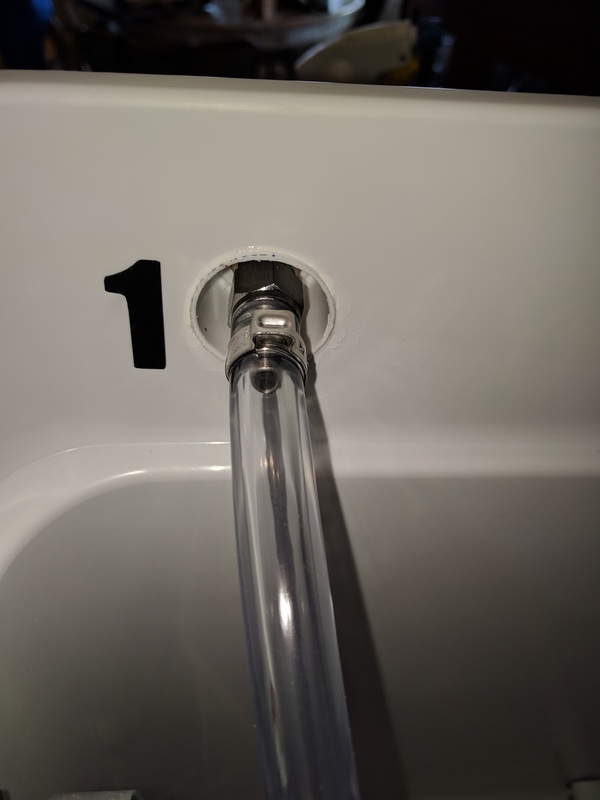 They work well, and if you pair these with sections of hose on your faucets, you can daisy chain all your faucets together and clean all your lines at once. The way I use them, it requires a pump, but I already have a pump in my equipment arsenal. Pros - Ingenious little gadgets that work well and are affordable. Leak-free connection at ball-locks. Allows you to recirculate cleaner for better cleaning. Cons - I have a mix of faucets (Vent-matics, Intertap, stout faucet) and the spouts are slightly different diameters which makes it hard to daisy chain them. Inevitably, a hose slips off a faucet and line cleaner gets pumped all over the place. Also, there's a huge pressure drop from daisy chaining five taps and their 3/16" lines together. It definitely restricts flow and reduces the benefit of recirculating. 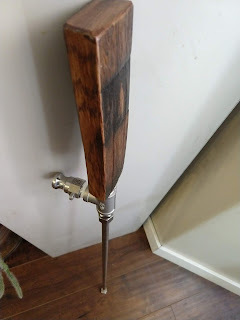 Keg posts with manifold - This is my latest solution for line cleaning. This is also based on a gadget from BrewHardware. 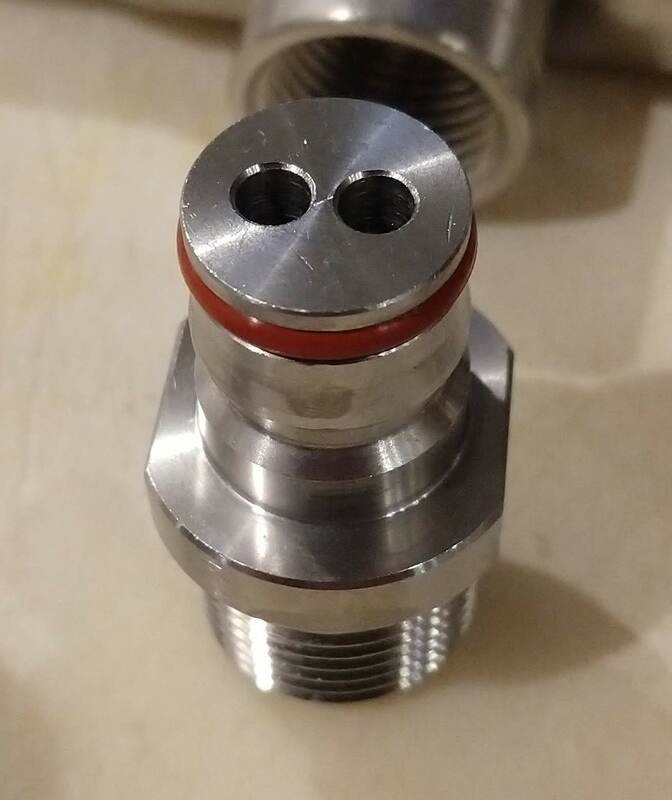 On one end you have a keg post similar to their machined jumpers and the other end is a standard 1/2" male NPT threaded fitting. 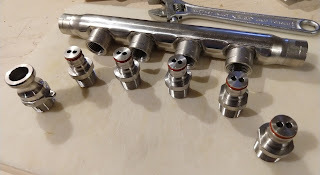 I partnered these with a 1/2" manifold from Home-Flex and a camlock disconnect. The manifold is intended for use in CSST installations but it's made from 304 stainless, so it should work just fine for this application. All ports are 1/2" female NPT so all it takes is a little bit of Teflon tape to seal up the threads. All faucets flow back into my reservoir (bucket) for recirculation. Pros - All stainless manifold so it should hold up to caustic-based cleaners and acid-based sanitizers. Less pressure drop and much higher flow compared to daisy chaining. All lines cleaned at once. Cons - Not really any. The only one I can think of is the posts are one-piece, so no poppets. I actually consider this a positive to because there aren't any moving parts or seals to wear out (other than the exterior post o-ring). However, unless I block off one or more ports, I always have to clean all five lines at the same time. Again, kind of a pro because there's no excuse for not cleaning all the lines. 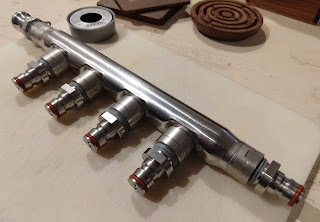 One thing worth mentioning, the body of the manifold is made from stainless tubing so it's much thinner compared to stainless tees and crosses, but it seems heavy enough. 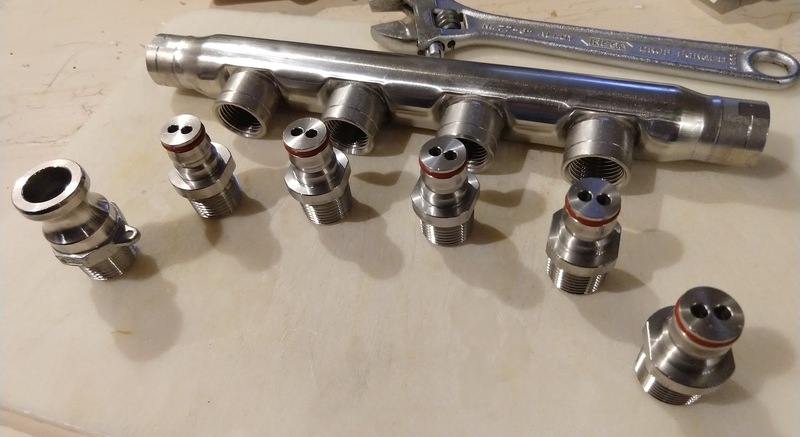 As for assembly, just screw the threaded fittings into the manifold. I chose to install the camlock at one end of the manifold and the keg posts on the middle four and opposite end. Don't forget to use Teflon tape on the threads; this will eliminate leaks and galling of the threads. Using it is pretty self-explanatory. You need a reservoir to supply the pump with line cleaner or sanitizer. I use the same silicone hoses to make the connections that I use on my brew system. Pump gets connected to the manifold, then each line is connected to the manifold. Then turn on the pump and open the taps. Make sure you follow the instructions on your cleaning and sanitizing chemicals. Here are a few pictures of the setup. Today's recipe is for an Adambier and is based on Hair of the Dog Brewing Company's interpretation of the style, simply named Adam. In fact, this recipe reportedly comes directly from Alan Spirits at HotD via Sean Paxton, the Homebrew Chef. We're brewing this beer as a group project, and by "we", I mean Brandon, Jeff, Nate, and Rob (me). Some previous group projects included our buddy Ryan, but he lives in Texas now so Nate jumped into Ryan's spot. This is going to be a huge beer that will be consumed slowly over a few years, so it's a good one to split with friends. Adambier is one of those nearly extinct historic styles that most people have never heard of and there really aren't a whole lot of commercial examples out there (HotD’s Adam is the only one I’ve ever seen packaged for sale). Standard guidelines are pretty scarce as well. I first heard about the style when I was doing my pro-am Cahoots Flanders Red with Uinta Brewing. They had brewed up a batch of Adambier for some special events including GABF. In fact, a small portion of the Adambier made its way into the final Cahoots blend (one port barrel filled roughly 50/50 with Flanders Red and Adambier). The style is essentially described as a German lagered version of a Barleywine. Note, I said “lagered version of a Barleywine”; it's an ale that's lagered, rather than a beer brewed with lager yeast. It's very likely that this beer was cold-aged in order to round out the flavors and let some of the hot alcohols mellow. As for descriptions of the style, the Maltose Falcons seem to have the most complete write-up on their club site. Other sources describe the style as a marriage of malt, sour, and smoke, but I doubt the sour was very pronounced and probably wasn't even intentional when/if it occurred. Similar to an Old Ale, the sourness is likely subdued and the byproduct of extended aging on wood rather than something akin to a Flanders Red where acidity is integral in defining the style. One thing that is consistent is the description of smoky character which dates back to a time when all malt had at least a little bit of smoke character from direct-fired kilns. This recipe uses peat-smoked malt, something that almost every professional brewer as well as homebrewer will tell you to steer clear of due to its overwhelmingly intense smoky character. This is my first time using this malt and I can tell you my hands smell smoky just from bagging the two and a quarter pounds for this recipe. Even with the smokiness that is likely to come from the peat-smoked malt, this style is all about the malt. Malt, malt, and more malt is the name of the game. We're using Imperial Tartan yeast for this batch, which is a yeast strain known to emphasize malt character in finished beer. This beer is going to spend some time in a rye barrel from Sugarhouse Distillery once primary fermentation is complete. I'm not sure if it's the char, the micro-oxygenation, or a combination of the two (most likely), but there's definitely some magic that takes place in a barrel...softening, conditioning, rounding flavors. If you don’t have a barrel for a beer like this, consider charring some oak cubes and adding them to secondary. Well that's enough talk. Now to the recipe as we're making it today. Due to the high gravity, this is a bit of an advanced beer. If you're stumbling across this recipe and you're a first-time homebrewer, I would not recommend starting with this recipe. Target OG: 1.134 - As gravity increases, efficiency drops. I doubt we'll get to 1.134, but it's going to be high regardless. The total recipe is listed below. Due to volume restrictions in both the mash and the boil, we will most likely divide the mash and boil in half. Fermentation will be divided across three fermenters. Mash at 155F, 120 minute boil, start fermentation at 62F and ramp up to 67F over 5 days. Considerations - Due to the extremely high starting gravity, you really need to ensure your yeast are as healthy as possible. Yeast starters, yeast nutrient, and proper oxygenation before fermentation starts are all very important. Additional doses of oxygen are fine up until you start seeing signs of active fermentation. I specially ordered yeast for this batch to ensure it was as fresh as possible. Make sure your mash tun is large enough to accommodate the entire grain bill. A giant whisk may work better for mixing and breaking up doughballs than a traditional mash paddle. We're still in the middle of mash #1. This pushed my mash tun to the max. I had the flow set a little higher than normal to ensure a consistent temp throughout the mash bed, but I started seeing signs that it was compacting. I went ahead and reduced the flow, then stirred the mash to reset the bed. More to come. Part 2: Petty much the same as the first half of the mash. Gravity came in at 1.114 (26.8 P). We lost a little bit of wort on the hop spiders. First fermenter got a little over filled, second fermenter filled exactly 5 gallons, and the last one was around 4 gallons. Long story short, we're a little shy of 15 total. We did a 2nd runnings beer as well. We threw a variety out late addition hops including Centennial, Cascade, Simcoe, and 2017 Hop Hash; nothing that will ever be repeatable. Post-boil OG was about 1.035. It was pitched with US-05. This beer was transferred into the rye barrel today. The barrel has a fair amount of headspace. I think it could easily handle another 2-3 gallons, so I may brew up a top-off batch. Before filling, I purged the barrel with CO2. As for other process info, see below. Ideally, you should be refilling barrels within a couple days of emptying. This barrel sat empty for an extended period of time, so it needed to be rehydrated. My standard procedure is a modified French method where I fill the head with 180F water and let it soak for about 10-15 minutes. 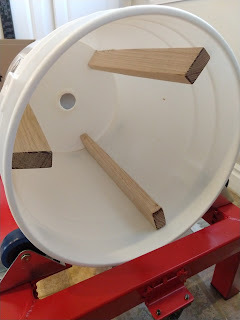 The barrel is then flipped over and the process repeated on the other head. Lastly, I fill the barrel with 180F water and let it sit for about 30 minutes before emptying. I also tend to wax my smaller barrels. The intention in doing so is to reduce oxygen permeability so that it's mimics the oxygen transfer relative to surface area of larger barrels. For 10 gallon barrels, I wax 75% of the staves. For 15 gallon barrels, like this one, I wax 50% of the staves. Note: I originally indicated we were putting this into a bourbon barrel; it's actually a rye whiskey barrel. I finally got around to kegging the 2nd runnings beer that we've been referring to as Jr. It's got a ton of hop flavor and aroma. It's kind of a murky light brown color, maybe a bit lighter than a typical British Mild. I added some gelatin to try to improve the clarity. Body is on the thin side. I probably wouldn't be super happy if this was the beer I was trying to brew, but as a "free" 2nd running beer, it's not bad. To bring in a bit of English brewing heritage we developed the “Old Ale” blend. It includes an attenuative ale strain along with a small amount of Brettanomyces. The blend will ferment well in dark worts, producing fruity beers with nice complexity. 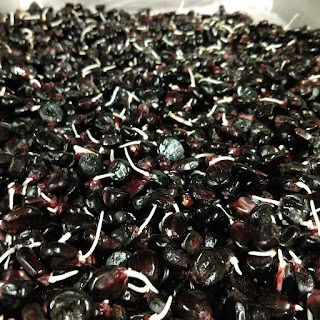 The Brettanomyces adds a pie cherry-like flavor and sourness during prolonged aging. An ale of moderate to fairly significant alcoholic strength, bigger than standard beers, though usually not as strong or rich as barleywine. Often tilted towards a maltier balance. “It should be a warming beer of the type that is best drunk in half pints by a warm fire on a cold winter's night” - Michael Jackson. For this first attempt at the style, I'm using the following recipe. Mash at 152F, 90 minute boil, start fermentation at 65F, then ramp up to 70F over 4 days. *The only reason I'm putting the treacle syrup in secondary is I couldn't find it locally. I had to order it online and it still hasn't arrived. Normally you'd probably add this at the end of the boil so that you don't lose any aromatics. No issues. OG came in at 20.6 brix (1.083). Water-wise, this batch got 3 gallons of distilled water along with about 8.5 gallons of carbon filtered tap water. Fermentation is pretty active this morning. Checked this morning and fermentation was so active that there was a little but of blow-off between yesterday and today. My stainless blow-off setup contained everything, so there wasn't any mess. Still chugging along. The Black Treacle syrup still hasn't arrived yet, but it's on its way. **Updated** Our mail carrier dropped off my Black Treacle this morning before I left for work. I added the Black Treacle last night. I heated the syrup a bit by placing it in a bowl of hot water. This helped ensure it wasn't too thick and sticky to flow into my fermenter. Fermentation had slowed a bit, but the addition of simple sugars has increased activity. We've had a bit of a cold snap and I noticed my fermentation chamber was having a hard time maintaining the 70F temp. I decided to move the carboy into the house for time being. I decided to pull a sample as well. The refractometer read around 12.2, giving a corrected gravity in the ballpark of 1.026. I think the actual gravity is lower than that, but there's no point in taking a hydrometer reading yet. The flavor was really nice, quite malt-focused and I can pick up on some of the complexity from the Black Treacle. There isn't really any perceptible brett character or acidity quite yet. There's some alcoholic warmth, but it's not hot or fusel. Definitely excited about the potential for this beer. I kegged this beer yesterday. The brett is noticeable, but I'd say it definitely comes across as more fruity than funky. Bitterness is on the low side, and the malt comes through. There's also a bit of sweetness. I'm planning on force carbing in the keg, then bottling the while batch off the keg. After work brew session! I'm trying to fit a couple brews in before Thanksgiving, so I'm doing one of my late evening brew sessions. Today I'm brewing a somewhat experimental beer. The base beer is essentially a Belgian Witbier but I'm doing a 100% Brett fermentation and I'm going to incorporate either rose water or orange blossom water into the beer. I'm shooting for quite a bit of citrus character so I'll probably add some zest in secondary. Here is the recipe as I'm planning on making it, but I may change things up as this beer progresses. Mash at 155F, 90 min boil. The house is a little cooler this time of year, so I'm going to just let this go at room temp, ~68F. No issues, OG came in at 17 brix (1.068). This batch had a much longer lag phase than I'm used to. I was seeing some signs of fermentation 24 hours after pitching, but it definitely wasn't as vigorous as sach strains and other brett strains. It now has krausen about 3/4" thick. I doubt I'll run into any blow-off issues with this batch. Just got back from our Thanksgiving getaway. This beer is chugging along, still with about 3/4 to 1 inch of krausen. This is still plugging along. The krausen has mostly dropped, but there's positive pressure and a bubble about every 15-ish seconds. There's still a ton of yeast in suspension which is fairly typical as brett tends to not flocculate very well. I'll probably let this go until 12/15 before I pull a gravity sample. I added blood orange zest and tangerine zest on 1/26. This yeast just kept plugging along with a CO2 burp about every 30-ish seconds until just recently. Looking forward to kegging it soon. I kegged this beer yesterday. This has some fantastic citrusy aroma. I haven't done anything with rose water or orange blossom water quite yet. Once the beer is carbed, I'll do some micro dosing experimentation. I'm thinking rose water may be the better choice, considering the citrus character already present from the zest. I haven't checked the pH, but there's a little bit of acidity there. I wouldn't call it "sour", definitely more on the tart side. This recipe is for 5 gallons. Our total batch size is 15 gallons, so this recipe 3Xs. Mash at 158F, 90 minute boil, ferment at room temp. No major issues, but a couple of minor ones. First, I'm not sure if the Solstice Genie is less plump than the base malts I usually use, or maybe my mill was just having issues, but on the first pass there were quite a few uncrushed or barely crushed grains. I ended up fiddling with the gap and ran the grains through a second time and it worked well. It's probably about time to disassemble the mill and perform some maintenance. We basically did one ten gallon batch on my system followed by a five gallon batch on my buddy's system. The 10 gallon portion came out with an OG of 1.064, and the remaining five came out at 1.055. I pitched the yeast last night around 7:30PM and fermentation is very active this morning. I was hoping I could get away without using a blow-off, but I'm afraid I'm going to come home to a mess tonight if I don't. Thankfully, this batch never had a messy blow off. As of this morning, the Tilt I put into one off the three fermenters is reading ~1.008. I'm kind of blown away that this yeast was able to tear through the sugars as fast as it has. This beer was racked into the barrel today to begin the souring process. The Belgian Candi Syrup was added first, then the beer was racked on top of it. I've recently been drawn more and more to lagers, so today I'm brewing a New Zealand Pilsner inspired by NZED Pilsner from Salt Fire Brewing. This isn't a clone, just something in the same vein. This beer is basically a German Pilsner base featuring New Zealand hops. I'm shooting for a bit more hop character than a typical German Pils. Here's the beer as I'm brewing it today. No issues. Mash pH measured 5.25. Post-boil pH measured 5.36. OG measured 12 brix (1.047). I only got the temp down to ~70F, so I won't be pitching the yeast until it gets down closer to 46F, likely tomorrow morning. I pitched the yeast tonight, about 24 hours after transferring into the fermenter. I noticed my Czech Pils had an acetaldehyde problem and I'm thinking it's most likely due to under-pitching or oxygen exposure post-fermentation. To be safe, I pitched a second pouch of Global in addition to the one I've been stepping up. Fermentation is plugging along. I'm using my Tilt Hydrometer to monitor the temp and gravity. I forgot to calibrate it before transferring the wort to the fermenter, so it was reading a few points low compared to the refractometer reading (1.045 vs 1.047). As of this morning, it's dropped to around ~1.036. This is an approximation because during active fermentation, the gravity readings can vary a little bit. One nice thing, the Tilt's temp reading is really close to the reading I get from my temp controller with the probe attached to the side of my fermenter (typically no more than 0.5F difference). 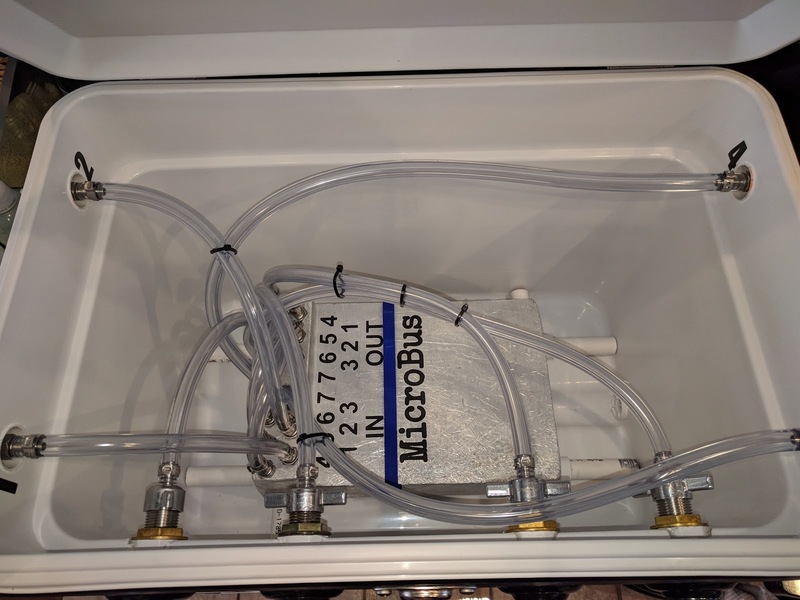 I know a lot of brewers swear that thermowells will give you more accurate readings, but I tried using one with my current hot liquor tank back when I first built it, and I found that sometimes it was off but as much as 7F. 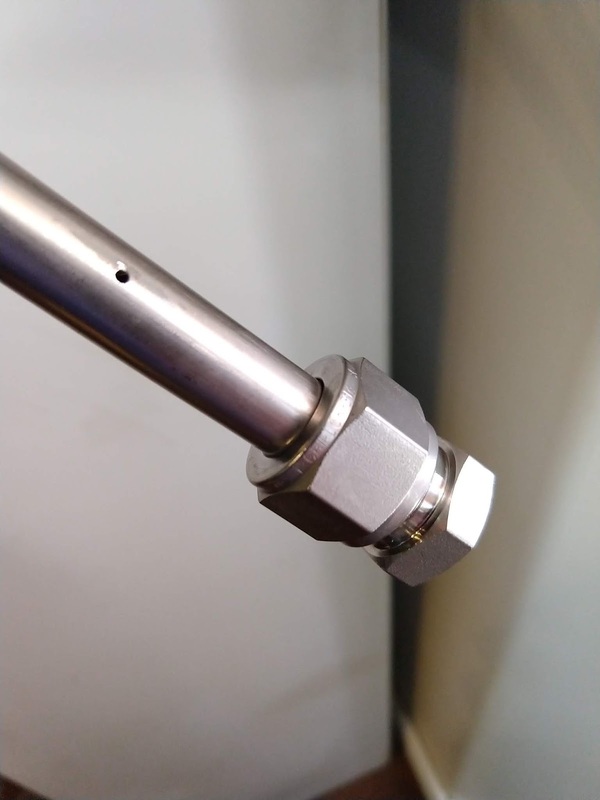 I'd move the probe around slightly, and the temp would change, so it seemed like it wasn't making good contact with the interior of the thermowell. Some kind of thermal paste would probably have resolved this issue, but I didn't want to have to deal with messy paste anytime I pulled the probe out for cleaning of the HLT. 7F isn't much of a concern when it comes to a hot liquor tank, but that's huge for fermentation, so I just don't trust thermowell readings for fermentation. Gravity is down to 1.027 this morning. At this rate, I should definitely be starting the diacetyl rest before the weekend is over. I'm still mulling over the dry hop additions. I want the NZ hops to be apparent, but I also want the base beer to come through. I'm probably going to wait until after the d-rest and see where the hop flavor and aroma are at. I'll probably also take a look at dry hopping rates for some IPL recipes so that I (hopefully) don't overdo it. Gravity is down to ~1.015 this morning so I'm starting to raise the temps for the diacetyl rest. I use an Inkbird ITC-310T-B temp controller for the diacetyl rest as well as the cold crash that follows. It's nice because I can program up to 12 steps at a time, so it will automatically raise and lower ferm temps for me. There's a bit of sulfur in the aroma in the ferm chamber, but that's fairly normal with this strain and it'll take care of itself in time. Gravity is down to ~1.008 this morning. For the dry hopping, I think I'm going to go with 7g of Waimea, 7g of Pacific Jade, and 7g of Green Bullet. I'll probably start DH in a couple days. I checked the gravity tonight and it's showing a 1.011 which seems crazy, but the gravity readings can jump around a little bit depending on activity, yeast rafts, krausen, etc. I added the dry hops tonight. I went with 7g of each for Green Bullet, Pacific Jade, and Waimea. I kegged this beer tonight and put it in my keezer under about 14 psi off CO2. The Tilt was showing a finished gravity of 1.008, consistent with the reading on 9/24. I ended up using a Brulosophy-inspired mylar balloon for the cold crashing. Basically, The balloon acts as a CO2 reservoir so that it doesn't draw any oxygen in during the cold crash. Burgers...they pair well with beer, they're a great summertime grilling option, and because everyone in my family likes them, we tend make them fairly often. A while back, New Belgium's blog had a burger recipe courtesy of one of their favorite food trucks, The Tramp About. 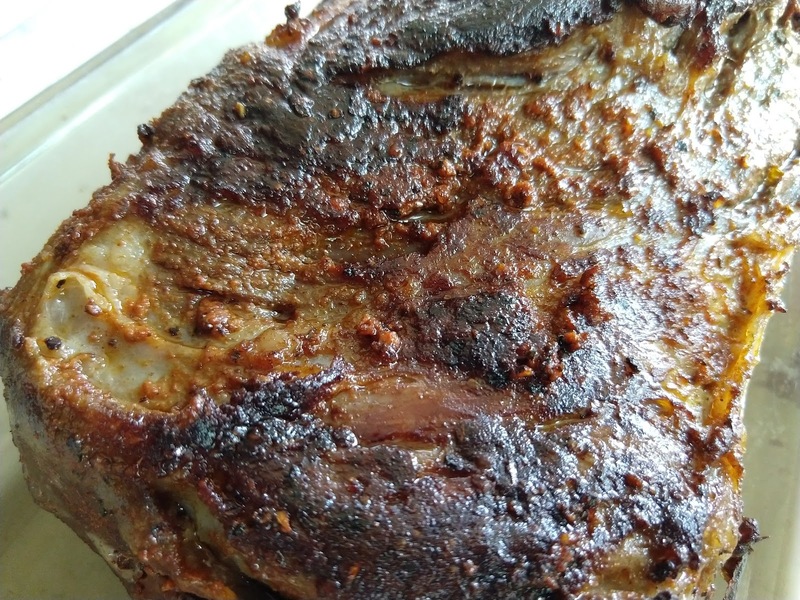 I made this recipe a while back and everyone loved it. The only thing I ended up changing a bit was I reduced the size of the patties because 7oz was a little too big for most of our kids. I have some nice big heirloom tomatoes ripening on the vine, so I figure it's a good time to make this recipe again. In my opinion, the tomato bacon jam and jalapeno aioli are what make this burger so great. A nice homegrown heirloom tomato doesn't hurt. Add all ingredients to food processor except for egg yolks, oil, salt and pepper. Process for 30-ish seconds. Add eggs and continue to process while slowly adding oil. Process until fully emulsified, then gently stir in salt and pepper. Cut bacon into 1/4" strips and cook on medium heat in a medium saucepan until fat is rendered. Add diced onion and cook until translucent. Add remaining ingredients and cook for about 45 minutes, stirring occasionally. It's not rocket science here...patty + aioli + Romaine lettuce + slice of tomato + jam. The aioli and jam are kind off like crack...prepare to be addicted. Today I'm brewing my third Czech Premium Pale Lager. The first attempt at this style won a gold medal while the second didn't fare as well. Comments on the second version indicated the judges thought it had a brett infection. Given how many sour/wild beers I brew, this is entirely possible and I thought I was also able to taste a little funk, especially after a few months in the bottle. I don't believe that brett and bugs are the bogeyman that a lot of people make them out to be, but it goes to show that you need to be careful. 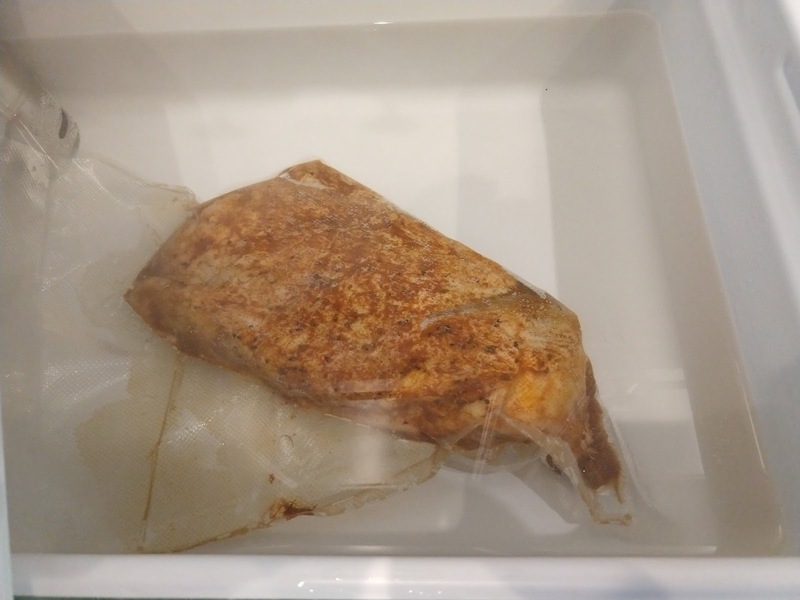 In my case, I believe it was picked up in my counter-pressure filler, so I've changed my sanitation procedure by incorporating a pasteurization step every time I use it (140F recirculation while submerged in the same 140F water for about 20 min; heated by my sous vide cooker). Mash at 154F for 90 mins, 90 minute boil, chill to 44F, aerate well and pitch yeast. 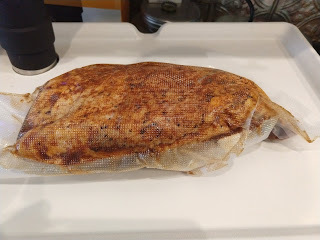 Raise temp to 50F over 48 hours. Raise temps to 64F for the diacetyl rest. Cold crash after a couple days. No issues in this brew session. I was working on some other projects at the same time, including putting up a trellis and getting started on my first attempt at homemade pastrami. I had to run to the store at one point and had to enlist my son to do the 30 minute addition. OG came in at 13.9P (1.055). This beer went in the keg today along with some gelatine for fining. So...this beer has a little bit of a problem. It tastes great right off the tap, but once it starts to warm up it's apparent there's some acetaldehyde. It comes across much more in the aroma than the flavor, but regardless, it's not good. Poor yeast health - Acetaldehyde is naturally produced during fermentation. Towards the end of fermentation, the yeast converts it to ethanol. If yeast health is compromised, they may not be able to finish converting it. Transferring too soon - Even if the yeast is healthy, if you pull the beer off the yeast cake too early, it can result in acetaldehyde. Oxygen exposure - I've read that O2 exposure post-fermentation can result in ethanol being converted back to acetaldehyde. In this case, I suspect that oxygen exposure is probably the culprit. Just a quick post today. I'm brewing another Berliner, this time kettle-soured with GoodBelly SuperShots, then primary fermentation with Wyeast 3191Berliner Weisse Blend. This is by far my favorite blend for BW due to combination of the sach, brett, and lactobacillus in the blend. As I indicated, I'll be kettle-souring, so the bulk of the acid production will happen pre-boil, before the blend is pitched. The process is mash, collect ~7 gallons, pre-acidify pH to 4.5 or slightly less, raise to 180F for about 15 minutes, chill to ~100F, transfer to my 1/4bbl Sanke and pitch lactobacillus. Then let it ride until pH gets where you want it, 3.2 - 3.4 in my case. Next, boil as normal, chill, ferment. Here is the recipe as i brewed it. Mash at 150F for 90 minutes, kettle sour at room temp, 90 minute boil, no aeration, ferment at room temp. No issues. Wort was acidified to a pH of 4.42 using phosphoric acid. 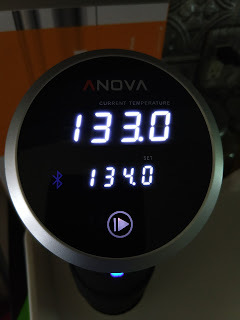 I was doing other things around the house in addition to brewing, so I think I held the temp at 180F for about 45 minutes. That's not a problem though as the purpose of this step is to pasteurize. Wort was chilled to just below 100F and GoodBelly was pitched. I did use two GoodBelly SuperShots because they were not quite as fresh and I figured some of the cells had probably died off. The pre-boil pH dropped down to 3.20. This is lower than I've ever gotten without acidifying to <4.5 for kettle souring. The end of boil pH is 3.27, probably due to the addition of hops, yeast nutrient, and/or Whirlfloc. No issues during the boil. Gravity came in exactly at 11P (1.043). I'm seeing signs of active fermentation this morning with about 1 /2" of krausen. That's a good sign because this blend can be a slow starter and the smack pack didn't swell as much as most other strains. Today I'm brewing an experimental version of my smoked porter. The first version of this beer took a gold medal for smoked and wood-aged beers and the second version did as well. The third version on sassafras didn't fare quite as well and I personally hated the rootbeer-like character it got from the sassafras. So today I'm brewing the fourth version which will be a split batch. The biggest difference with this version is I'm using hickory-smoked malt that I smoked myself for my base malt. After primary, I'm planning on splitting off 2.5 gallons which will receive 1 pound of Maple & Bacon Smoked Candi Syrup. The home-smoked malt was cold-smoked using my newly completed malt tumbler. I suspect this version will have a much stronger smoke character because of the larger proportion of smoked malt, and because hickory trends to yield stronger smoke flavors compared to some other smoking woods. I love a strong smoke flavored beer, so I think I'll enjoy it, but it might be a little too strong for some. Split batch with 1# of Maple & Bacon Smoked Candi Syrup added to half the batch after primary fermentation subsides. 10 gallons distilled water using Beersmith's London water profile. No issues. OG came in at 20.8/1.085. I transferred this beer to two secondaries today. Half was racked onto the Maple Bacon Candi Syrup. I'll probably let this go about a week or two then add the wood for aging. These variants went into kegs tonight. These have been sitting on hickory since 6/2/2018. Smoke on these is noticeable, but doesn't dominate. The maple-bacon variant is interesting. The maple character is subtle. The bacon component is a bit harder to identify. I'm interested to see how it changes as it carbs. Both variants got bottled today. I'm really happy with the way both of these turned out. I don't know if I'd use the maple bacon syrup again. It's super subtle and I don't think it really adds much to this beer. Equipment time! I stumbled across this post on Reddit by u/Bearded_and_Bored a little while back. 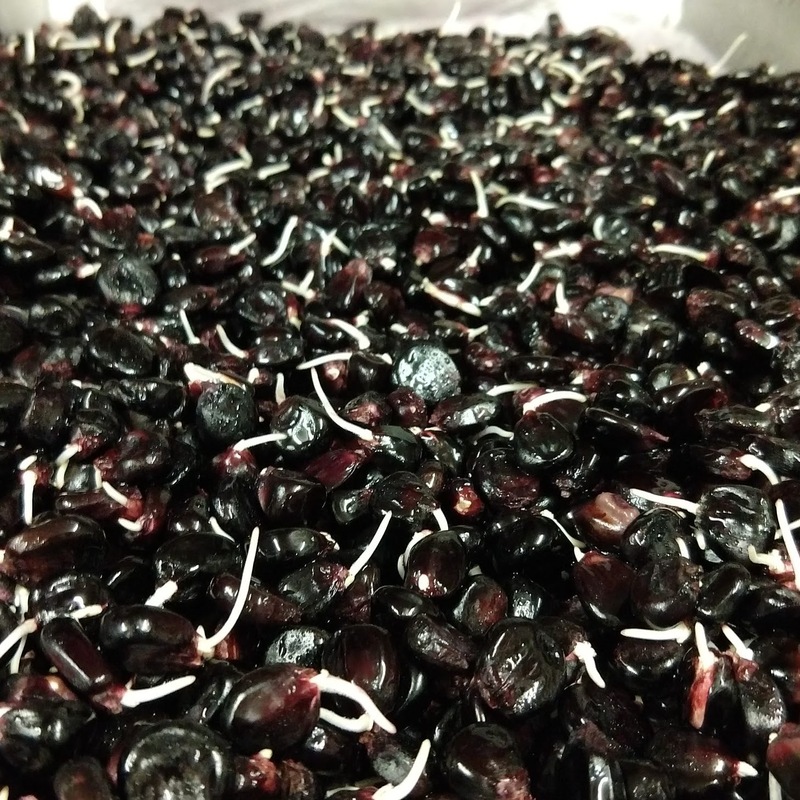 At the time, I was toying with the idea of brewing a Chicha-inspired beer but wanted to take advantage of malting the corn rather than doing the chew and spit thing. 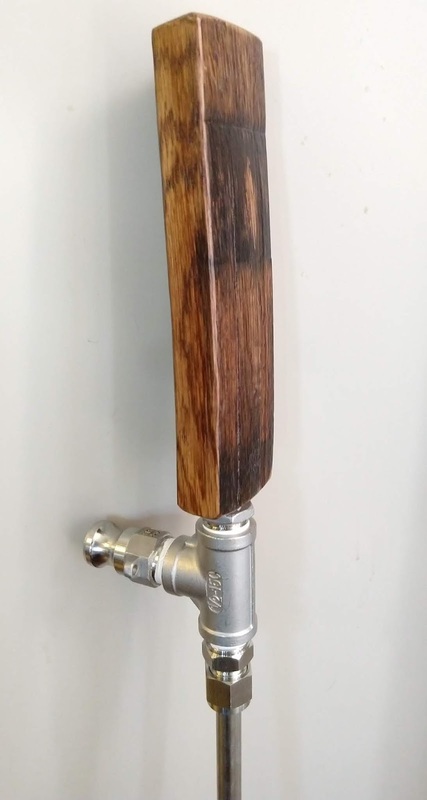 I also love smoked beers and was thinking this design would work great for cold smoking my own malt at home. 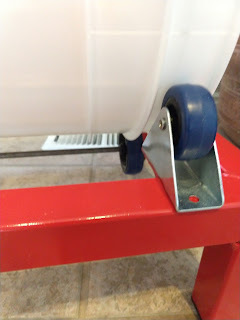 The design is fairly simple here; a standard food-grade bucket for the container, a simple box frame to mount everything to, a two casters connected to a rotisserie motor to turn the bucket, and a few more smaller casters to keep everything properly aligned. A picture (in this case a video) is worth a thousand words, so check out Bearded and Bored's Reddit post and related YouTube video for more info. Mine is essentially the same design as his, it's just made out of metal tubing rather than 2x4s. Add grain to the bucket. For the trial run, I used 6 pounds of California Select Malt. You want the grain to be able to move freely, so don't pack it full. Moisten the grain with RO, distilled, our some other de-chlorinated water source at the rate of 9.5ml of water per pound of grain. The water helps the smoke flavor and aroma "stick" to the grain. Fire up your cold smoke source and turn on the motor. Total smoking time on my first batch was about 2.5 hours. After smoking, transfer the grain to a paper grocery bag and let it mellow for at least a couple days before brewing. For the first go, I used hickory. Hickory can be pretty assertive, but I'm using it in a smoked porter and I think it'll be able to stand up to the smoke flavor. It's probably worth mentioning, for my cold smoke generator, I use a homemade aquarium pump venturi-style one. It works fairly well and puts out quite a bit of smoke. There are lots of options here though, Google cold smoke generators for ideas. Ideally you want something that isn't going to add any color to the grain due to temperature. At some point I'll try using this new piece of equipment to malt some corn and possibly other grain, I'm also planning on smoking grain with some different wood varieties. More on that later. Today I'm brewing a variant of my American Wild Barrel-aged Brown base. Grain-wise, the biggest change is I went with half Pilsner and half German Pale malt for the base. Note: I'd intended to go 50/50 on Pilsner and Pale malt, but when I went to measure out my base malts, I realized I was out of Pilsner malt. So this version got 100% Pale for the base. All dark malts are being added during the sparge this time (previously, only the Carafa III Special was added during the sparge). I'm using a portion of US Goldings rather than all aged hops. Lastly, this 10 gallon batch is getting split between INISBC-913 Brett Barrel III and dregs I've grown up from some Casey Brewing and Blending bottles. Mash at 157F for 60 mins, 90 min boil, ferment at room temp. Also, no aeration prior to pitching as I believe both of these cultures contain lactobacillus. Nothing fancy here. I filled my HLT with 2 gallons of distilled water and 8 gallons of carbon filtered tap water. Since this is a 10 gallon batch, the HLT was re ftfilled with the same radio after mash-in. No real issues. It seemed like I was starting to get a stuck mash about 10 minutes in. I ended up adding a bunch of rice hulls and resetting the bed. The Brett Barrel III half had about an inch off krausen yesterday morning and more last night. The Casey half had a tiny bit of foam here and there when I went to bed last night. It has a little more around the edges this morning, so it seems to be slowly getting going. The Casey half was rolling after I got home and Brett Barrel III seems to be slowing down a bit now. I'm going to move both out of the basement and into a warmer area of the house for the remainder of primary. The Casey half has really taken off and looks like it was close to needing a blowout last night despite the fact that it had quite a bit of head space. I pulled a sample of each tonight. The Casey half is quite sour and more or less tastes ready to carb. I didn't take a pH reading, but it's pretty assertive. This one also showed some signs of sickness/ropiness back on April 26th when I pulled a very early sample. The Brett Barrel III half is much less sour, but there's definitely some acidity there. There might be a touch of diacetyl there as well. This one probably needs to ride a couple more months. I transferred the Brett Barrel III half into my Solera today. I pulled about three gallons out of the Solera before transferring. The five from this batch weren't quite enough to fill it, so I topped off with a little bit of Flanders Red #4 w/Roeselare. I kegged the Casey half yesterday. This beer is pretty intensely sour. I felt like I was picking up a little bit of diacetyl. It also seems noticeably more sour than it did in September. Pedio will produce diacetyl which brett will convert into other compounds, and I think this is likely the source of both the diacetyl and the increased sourness. I went ahead and pressurized the keg to seal, but not really enough to force carb. I'm going to let this condition for a while at room temperature, hopefully allowing the diacetyl to get converted. Today I'm brewing the last of my NHC entry beers. This one is a variant of the Galaxy MicroBurst DIPA that I brewed a while back. Here's the recipe as I'm brewing it today. To 11 gallons of distilled water. No issues. OG came in at 21.2 (1.086). I didn't start my yeast starter as early as I'd hoped, so it still had a lot of yeast in suspension when I transferred from BK to fermenter. I decided to let it rest a few more hours then decanted and pitched the following morning. Dry hops were added today. Although it didn't move on to the final round, this beer scored well in NHC-Denver. It scored a 41 and the only real critical comment was one of the judges wanted more hop aroma. I agree, the hop aroma was pretty solid at bottling but had dropped quite a bit within 24-48 hours. It tended to come out more as the beer warmed. Hop flavor was pretty stable and it had a nice combination of pine and citrus. About two years ago I posted about my first jockey box build using a vintage Coleman Steel-Belted cooler. 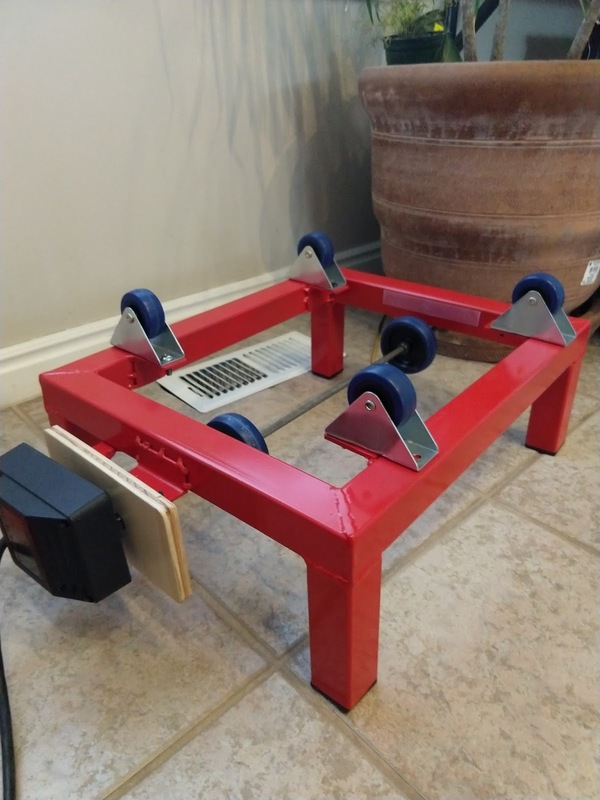 I really dig it, it works awesome, and it has so much more character than plastic cooler-based jockey boxes. Earlier this year, I stumbled across some brand new Steel-Belted Coleman coolers on clearance at Sam's Club. I figured maybe I could resell them on ebay and/or locally and make a few bucks. I had lots of interest in them, but unfortunately nobody actually showed up to buy them. 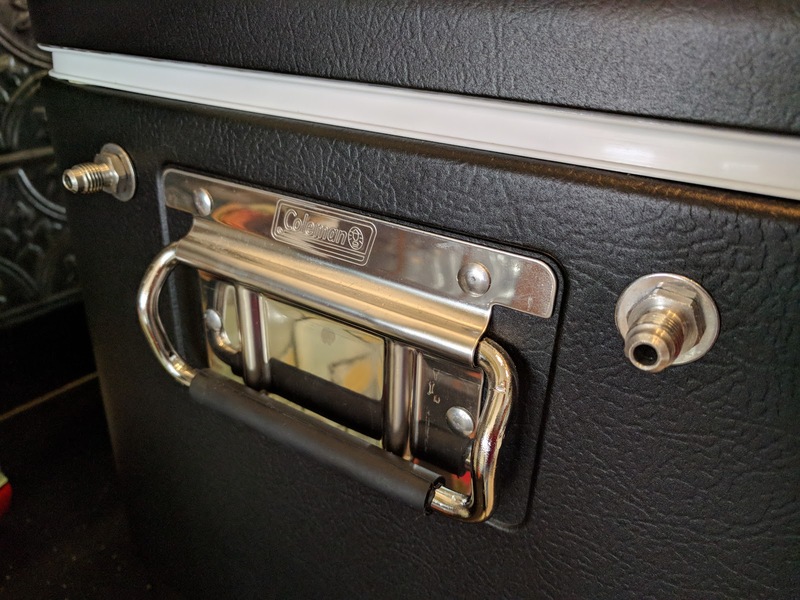 My original build used a Coleman cooler from the early 70's, and much like the cars of the day, it has straighter, more angular lines. The shape of the new coolers is closer to that of the vintage Coleman coolers from the 50's, nice rounded lines. The paintjob is somewhere between matte and satin black with a slight orange peel texture. 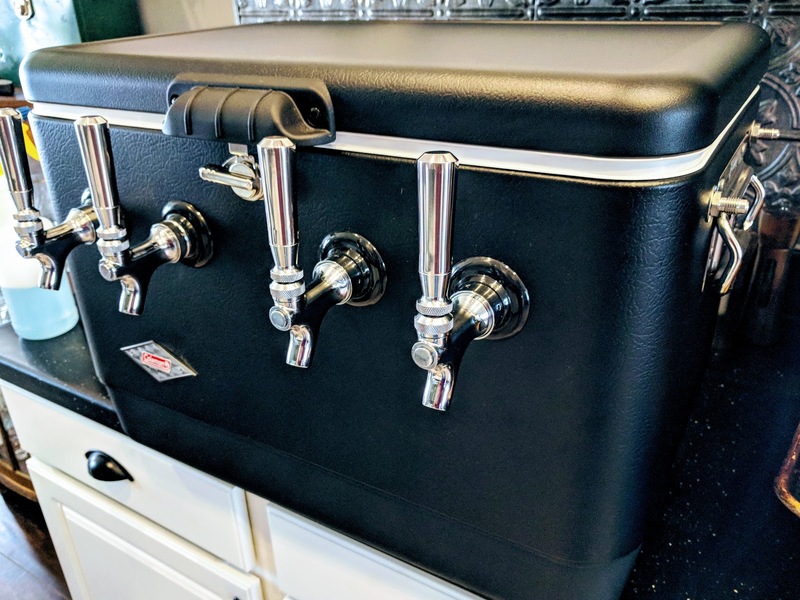 Combined with the stainless steel trim and the addition of some shiny faucets, I began to realize it would be a cool candidate for a jockey box build. It got me to thinking...I have some spare parts laying around from previous kegerator and jockey box builds...maybe I should build another jockey box. It wasn't long before I stumbled across a really good deal on another 7-circuit cold plate and I decided to move forward. Construction on this box is similar to the original with a few minor changes/improvements. Like the original, three lines make a double pass through the cold plate, and the fourth makes a single pass. 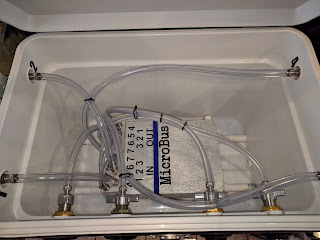 Instead of having all liquid supply lines on one side of the cooler, I have two on each side. That's not a huge change, but it should make arranging kegs a little easier. The biggest change between this one and the first one is I added plastic inserts for the liquid line bulkheads. I fabricated these out of Airborne Immune Support vials. These make it so I can really snug down the bulkheads for a secure fit. They're caulked which should help keep any moisture from entering the space between the outer metal skin and the inner plastic lining of the cooler...plus they give it a nice clean look. 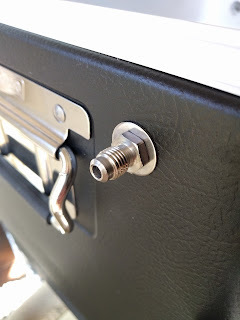 I'm probably going to go back and retrofit the original jockey box with similar fittings. Lastly, I changed the design of the cold plate stand slightly. This version has extensions that center the stand in the middle of the cooler and keep the cold plate from sliding around during transport. Enlarge the pilot holes using a drill bit the same size as the bit in your hole-saw. Align hole-saw bit to your pilot holes and cut appropriate sized hole in plastic liner. DO NOT cut through the metal skin with your hole-saw. Remember to run drill in reverse when using hole-saw on plastic. Use step bit to open up the holes in metal skin. Holes should be big enough for bulkhead to fit through on the liquid line holes, and big enough for the punch's bolt on the tap shank holes. I used a little bit of epoxy appliance paint to touch up the bare metal around the holes. This will help reduce the risk or rusting. Below are some pictures and a parts list. I've included prices where applicable to show that you can build these fairly affordably if you shop around and aren't in a huge rush. I say "fairly affordably" because...well, these things aren't cheap. A lot of the expense is in the stainless fittings and they can add up quickly. 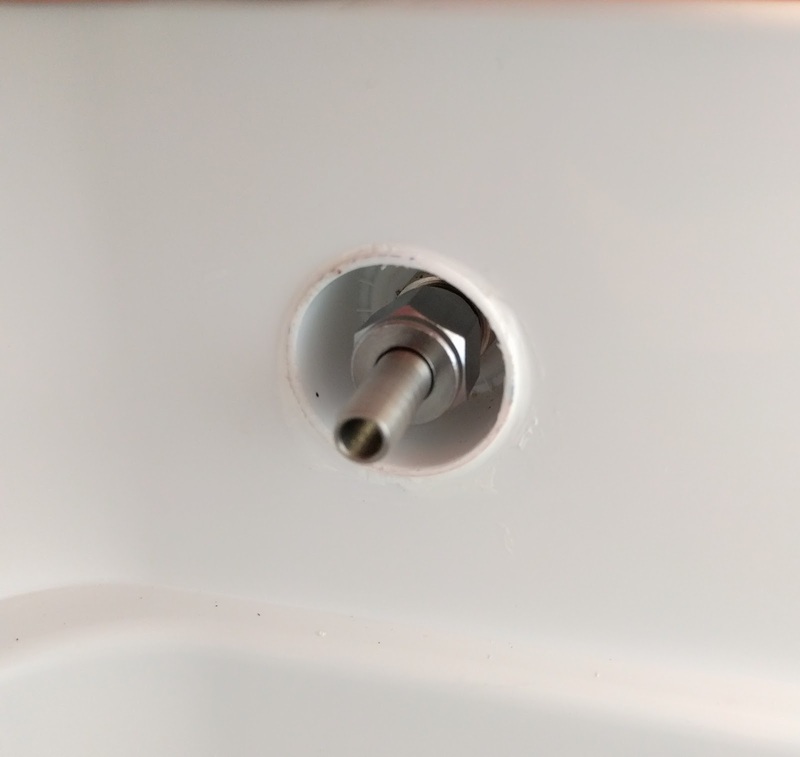 Plated fittings and faucets are much cheaper, but they're still not cheap. I'm the type that prefers to buy once and spend a little more money up front than have to replace parts later. That said, I got a pretty good deal on some chrome faucets so I skipped the stainless versions there. My total price was right about $250. Compare that to some of these pre-built examples and you can see that they can be quite a bit cheaper to build yourself.